A sweet-tasting fruit and native to tropical America, Papaya (or Paw Paw) while unripe contains digestive enzymes that complement the body’s own digestive juices. Take product at manufacturer’s recommended dosage. Papaya sprout readily from seed, even the seed harvested from grocery store papaya. To prepare seeds, scoop them from a papaya and spread them out on a single sheet of paper towel and leave out to dry for a week. At the end of the week, roll the seeds around to remove the dried husks of the seed coverings, then store them in a cool, dry place. To sprout papaya seeds, place them in seedling starting soil and keep moist and warm. Seeds sprout quickly and the plants will begin rapid growth. 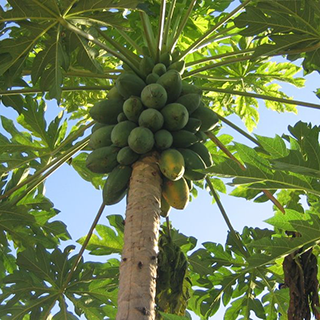 Papayas are ready to harvest when most of the skin is yellow-green (one quarter yellow). After several days of ripening at room temperature, they will be almost fully yellow and slightly soft to the touch. Dark green fruit will not ripen properly off the tree, even though it may turn yellow on the outside. Mature fruit can be stored at 7°C for about 3 weeks.